When an email was forwarded to me a few months ago about a woman who has been sharing Nonviolent Communication in the Middle East, I really didn’t imagine what it would lead to within weeks. I only knew that I was touched deeply and wanted to do something to support this woman. Tanya Awad Ghorra lives in Lebanon. She studied Nonviolent Communication (NVC) for ten days in 2009 at Lebanon’s Academic University for Non-Violence and Human Rights in the Arab World (AUNOHR) when doing a masters in nonviolent education and conflict resolution, with teacher François Bazier from Belgium’s Université de la Paix. Tanya caught fire and took it upon herself to spread the message of hope she received to people who she knew needed it. She has trained hundreds of people in a number of countries: including Egyptian and Lebanese NGOs; Ministry of Interior affairs employees in Kurdistan (after they signed a law protecting women from abuse, in order to help them understand nonviolence); students, parents and teachers in several schools; and the leading bank in Lebanon. As a coordinator on the national campaign to abolish the death penalty in Lebanon, she has introduced NVC to death row inmates. In addition to many media appearances and a talk about empathy with TedX Youth (video here), she has presented a weekly fifteen-minute segment for the last six months introducing NVC to the public on a TV station broadcasting to the Arab world, Europe and the USA. She is single-handedly continuing her efforts to respond with empathy, love, and determination to the plight of so many people in the region. It’s hard for me to find words to explain the depth of how touched I was. Tanya wanted materials in Arabic, which are very scarce in the network of NVC trainers. Despite heroic efforts by many, despite extraordinary projects going on in several countries in Africa, Asia, and Latin America, and despite the clear and persistent hunger on the part of so many people to receive training and support to bring NVC to their countries, I am sad to say that Nonviolent Communication is still, mostly, serving the countries of the affluent North. I found some small amount of materials through colleagues, sent them to Tanya, and found it hard to settle. In no small measure, this was fueled by my anguish about the situation in the region, and the fact that Tanya and I are from countries that are at war with each other. I wanted so much to support her efforts. I invited her to join my monthly clinic for people teaching NVC, which she did despite the extraordinary cost to her of doing so. The bond was deepening. Everyone on the call was moved by her shining enthusiasm, determination, and deep faith in human beings. 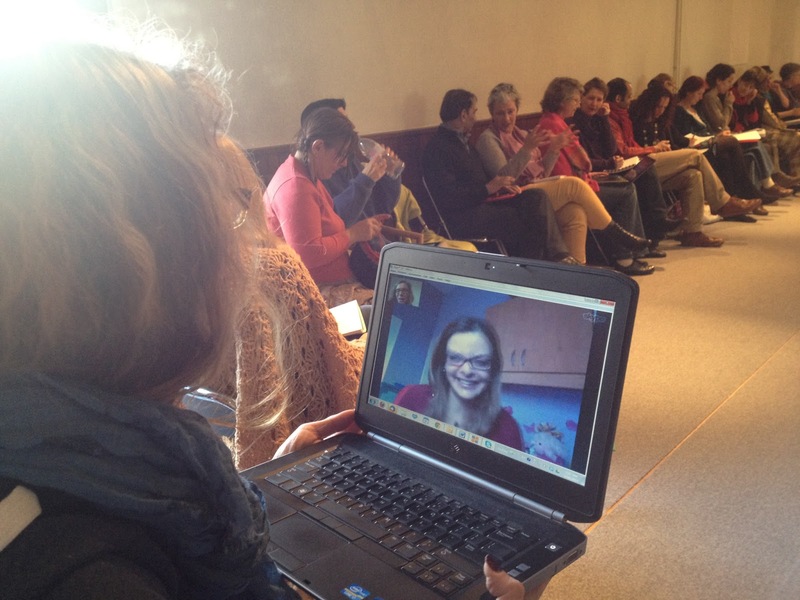 At the end of the call I had the idea of bringing Tanya to a training for trainers that I conducted in France ten days ago. The organizers and I agreed to support her with getting a visa and to take the risk of financial loss by inviting her to come and trusting that the funds would show up after the fact. Several weeks later, we kept hoping each day that Tanya would get her visa. The day that the training started it became clear that Tanya would not get her visa in time, or at all. We were ready to mourn and hope for another chance another time, another year. 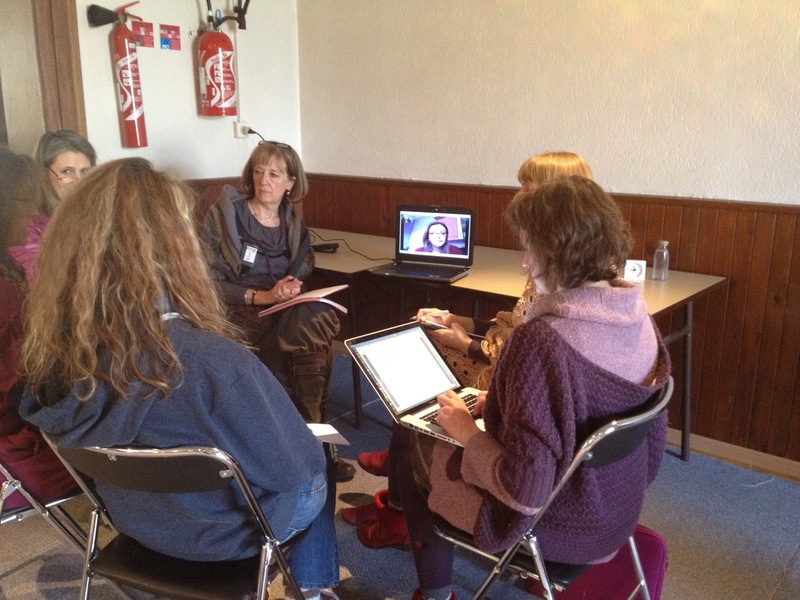 Then one of the translators suggested that we skype her in. From then until the end of the course, Tanya was with us. For some of the time she stayed with us even when airplanes of my own country of birth were flying over her city. She joined me, again, for another two-day course I did in Switzerland, which she had to miss a big part of because her son broke his wrist. Tanya is completely fluent in English and in French. She is now connected with a community of trainers in French-speaking Europe, and with a few other trainers from North America. She is connected with me. She is no longer alone holding the weight of hope against so many odds. This is a story that is going to continue to unfold. For now, I rejoice in finding a way to transcend the war between our countries, the mistrust of countries that don’t grant visas to people from the Middle East for fear of terrorism, (oh, the irony, if they only knew how deep is Tanya’s commitment to bringing peace to everyone around her), and the technological obstacles we had from time to time, to begin to forge a relationship I am looking forward to nurturing over time. I hope you enjoy the photos of Tanya participating in the circle and joining a small group practice. If you feel moved to contribute to Tanya’s ability to continue to receive support for NVC learning, click here and please make sure to name “Middle East scholarship fund” in the notes accompanying your donation. This entry was posted in Uncategorized and tagged Uncategorized on March 25 / 2013 by Miki. Any grieving we don’t do stiffens our hearts and shuts us away from fully engaging with life.